A beautiful, hardwood display to show off your skis The Indoor Ski Wall Rack is a sleek, stylish way to hang your skis on the wall while also doubling as a cool display. By mounting flush against the wall, the minimalist rack allows you to show off your skis instead of a bulky rack holding them. Now you can store your skis in the off season while dressing up your home, apartment, or office! Crafted from solid hardwood Each rack is made from a single piece of Black Cherry Hardwood and finished for a waterproof seal. 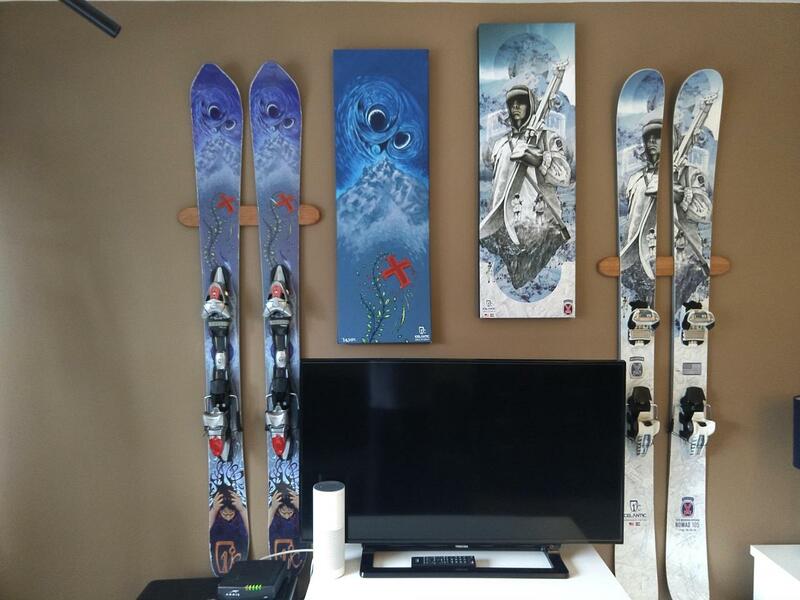 Not only does this rack look great on your wall holding your skis, but it has that furniture appearance to look great on it's own. Quick, easy installation The rack is easily installed with just two screws and drywall anchors, if needed. As a single piece rack, it can hold 2x the weight with half the needed wall screws. Brake ties included Each racks comes equipped with a set of brakes to allow your skis to hang flush against the wall without dings or scratches. I love the wall mounts. 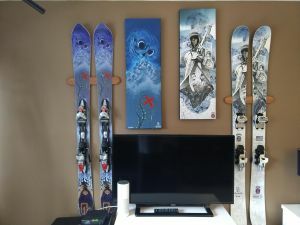 I have two pair of Icelantic skis mounted in my son's room along with the canvas prints next to them. Also, thank you for including the cord for the brakes.